Duke is was my first male Stafford and a special boy. He was also my first show dog and AKC champion. He won multiple Best of Breeds, Group placements, was ranked breed/all breed 2004, a 2005 Eukanuba National Championship AOM winner, and two year Crufts qualifier. 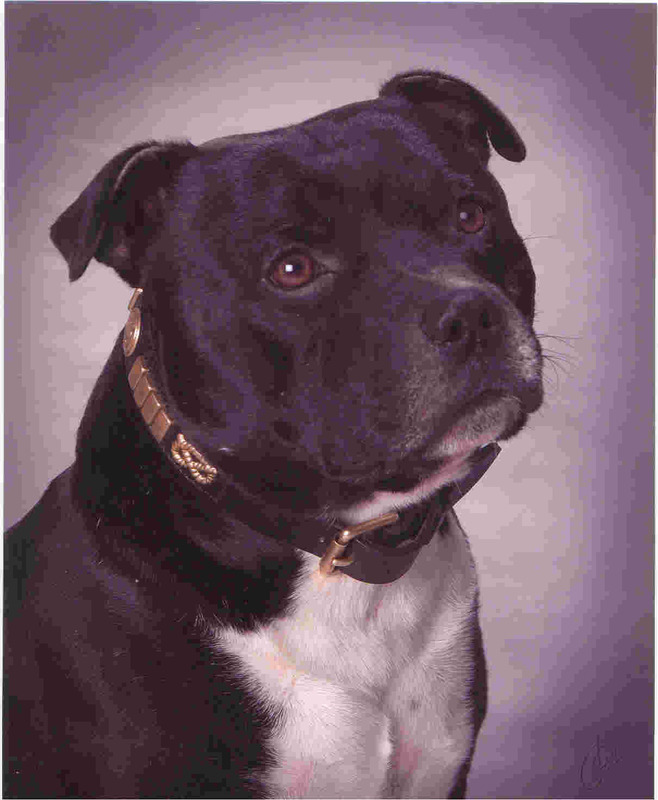 Duke also had his CGC (Canine Good Citizen), CD (companion dog) title, and RN (rally novice) title. 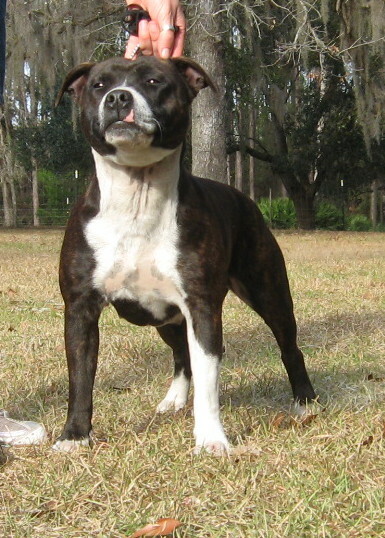 He was a great producer and sired 10 AKC champions. We miss you sweet boy. CH. Hogan's Reba Abbigail "Reba"
Reba was my first AKC champion girl. She was out of UK import CH. Nozac Intrepid Jet and bred by Mimes-Staff Kennels. Rest in peace piglet. Ramstaff Molly Sweet Spot "Molly"
Molly was my second Staffy and a full sister to Sadie. She is a foundation of my breeding program. Molly like her sister was crazy to play ball. She also had the sweetest, most patient, gentle personality. She will always hold a special place in our hearts. Ramstaff Lil Miss Sadie Mae "Sadie"
Sadie was my first Staffy and started my addiction to this breed. She was the smartest (at times too clever) and craziest dog that I've ever owned. She also LOVED to play ball non stop. She will always be missed. 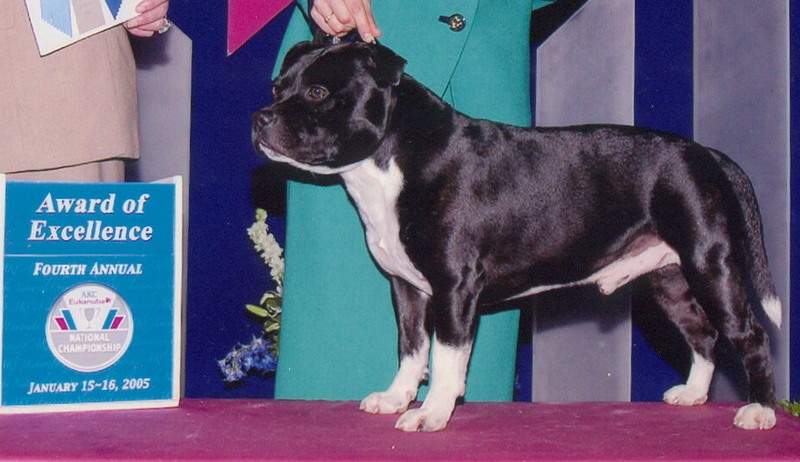 Rockstaff Ain't Miss Behavin' "Missy"
Missy was bred by us and was out CH. Dauntless Duking It Out ROM CD RN CGC and CH. Rockstaff Summertime. Missy was a active girl with a very passive temperament. We tragically lost Missy to a rattlesnake bite. We miss your happy, adventurous spirit sweet girl. Rest in peace.